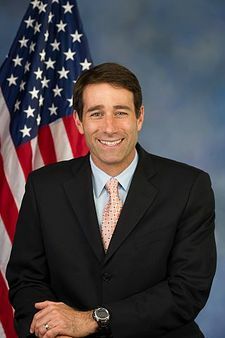 Garret Neal Graves (born January 31, 1972) is the U.S. Representative for Louisiana's 6th congressional district. On December 6, 2014, Graves, a Republican, handily defeated the Democratic candidate, former Governor Edwin Edwards. A native of the capital city of Baton Rouge, Graves received 139,194 votes (62.4 percent) to Edwards's 83,773 (37.6 percent). In 1965, Edwards entered the U.S. Congress to represent Louisiana's former 7th congressional district and had been a fixture in state politics for nearly a half century. Edwards and Graves had led in the primary with 30 and 27 percent, respectively. Among those eliminated in a bid for Congress was the strongly conservative former Louisiana state representative Lenar Whitney. For nine years, Graves was a legislative aide to former U.S. Representative Billy Tauzin of Louisiana's 3rd congressional district. He and the U.S. House Committee on Energy and Commerce, of which Tauzin served as chairmam. In 2005, he became an aide for the United States Senate Committee on Commerce, Science and Transportation under then Republican U.S. Senator David Vitter. He also worked for Democratic former U.S. Senator John Breaux, a protege of his later opponent, Edwin Edwards. He was the chief legislative aide to the U.S. Senate Committee on Environment and Public Works. In 2008, Republican Governor Bobby Jindal appointed Graves to manage the Louisiana Coastal Protection and Restoration Authority. In the position, he negotiated on behalf of the state with British Petroleum over the Deepwater Horizon oil spill. He resigned from the authority effective February 17, 2014 to prepare to make his race for Congress. Graves succeeded the physician Bill Cassidy in the House; Cassidy instead unseated Democratic U.S. Senator Mary Landrieu. In the 2014 nonpartisan blanket primary, Edwin Edwards finished in first place with 30 percent of the vote; Graves was the runner-up with 27 percent. Graves and Edwards then met in the December 6 runoff election, called the general election in Louisiana. Representative Graves has been mentioned, along with colleague Ralph Abraham of Louisiana's 5th congressional district, as a potential opponent of Governor John Bel Edwards (no relation to Edwin Edwards) in the 2019 state elections. Neither congressman would have to by-pass House reelection in order to run for governor. In 2017, Graves questioned the second Governor Edwards regarding the disbursement of federal assistance for victims of flooding from the previous year. Graves said that he is "focused on flood recovery ... none of the governor's talk is helping flood victims." In his race for a third term in the November 6 nonpartisan blanket primary, Graves faces opposition from Democrat Justin Ray Dewitt (born June 10, 1988), a homosexual land surveyor from Baton Rouge. DeWitt, the official choice of the Louisiana Democratic Executive Committee,describes his background as "working class" and reports that he will not solicit campaign contributions from political action committees established by corporations. A third candidate is Devin Lance Graham (born December 22, 1986), an Independent from Ascension Parish. Graves' father, John Graves, owns an engineering firm that contracts with the United States Army Corps of Engineers. Graves and his wife, the former Carissa Vanderleest, have three children. He is a Roman Catholic. ↑ 1.0 1.1 General election returns. Louisiana Secretary of State (December 6, 2014). Retrieved on April 10, 2018. ↑ 2.0 2.1 Questions remain about potential conflict. HoumaToday.com. Retrieved on November 24, 2014. ↑ 3.0 3.1 3.2 Edwin Edwards, Garret Graves headed for runoff in 6th Congressional District. The New Orleans Times-Picayune. Retrieved on November 24, 2014. ↑ 4.0 4.1 Jindal coastal adviser Garret Graves resigns, effective Feb. 17. NOLA.com. Retrieved on November 24, 2014. ↑ Greg Hilburn (April 21, 2017). Who will challenge Gov. Edwards in 2019?. The Monroe News-Star. Retrieved on April 10, 2018. This page was last modified on 21 August 2018, at 06:05.